Over Passover I had the chance to checkout Milano Collection's Los Angeles showroom. I wanted to share my general impressions. 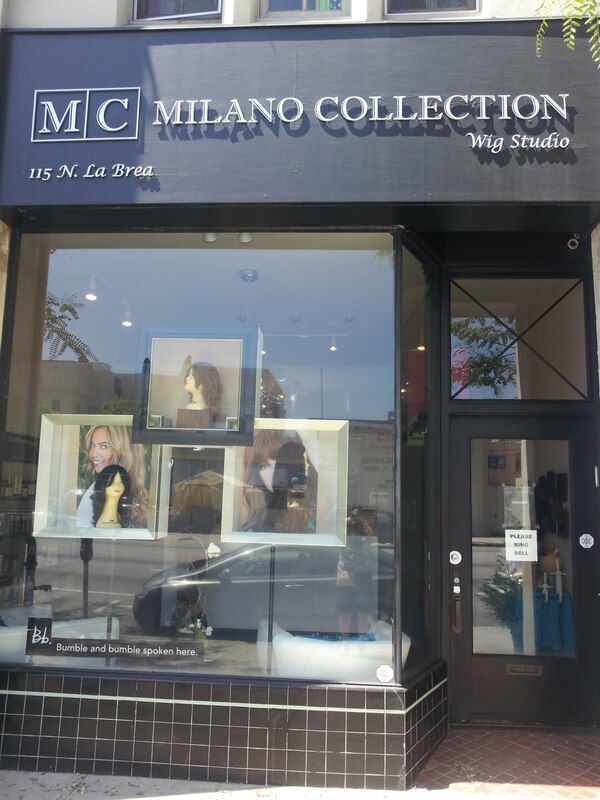 First of all, Milano Collection is one of the first "major Jewish wig brands" to open a dedicated showroom in Los Angeles. 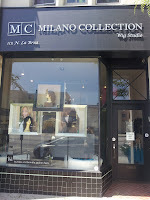 Los Angeles has sheitel machers who sell multiple wig brands as well as sheitel stores that carry various brands, but to my knowledge Milano is the first "NY Transplant" salon to open shop in LA. There was plenty of metered parking available right in front of the store, for the reasonable rate of $1/hour. There is also free street parking available in the residential neighborhoods a few blocks away but be careful because LA has strict parking regulations including some streets that require permits and others that have street cleaning on certain days a week. The storefront had a upscale look to it and displayed a few wigs in the window. You have to ring a doorbell and be buzzed in. I called Milano in advance and let them know that Chavi was coming to the store, believe it or not, they hadn't even heard of me!!! Well, I educated them on who I am and what my mission is - essentially providing wig information to consumers. They were happy to let me come in and take pictures and try on wigs to my hearts delight. I learned that Milano wigs come in two qualities: processed European and unprocessed European, and that the prices vary depending on length and hair quality. Their unprocessed wigs have codes such as LL-14 while the processed wigs have names like "Reese" and "Giselle". They organized their showroom by grouping the wigs in various color groups. They also had additional wigs in bins below each section. The shop attendant told me that pretty much all of the wigs out on the main showroom floor were considered "pre-cuts" . 2. The iFront line has a small strip of lace in the front that is supposed to make the hairline of the wigs look more natural. For whatever reason the lace on the lighter colored wigs was more noticeable then the lace on the darker colored wigs. 3. Milano wigs come in various textures but overall the processed wigs actually frizz less than the unprocessed wigs. 4. Pony wigs come in sizes L and XL because for many people its necessary to go up a size in order for them to cover all their hair and make the pony look natural. 6. I look better in hair darker than my own hair, even though my natural hair color is "dishwater blonde". The blonde wigs made me look completely washed out. I suppose if my true color existed it would look good, but its hard to find. The showroom offers tons of wig services aside from wash & set and cutting including coloring and deep conditioning treatment. Also, the cut price varies on how much one wants cut. I ended up buying something... will post about it later! Can anyone guess which of the wigs pictured in the album is the one I bought?? i want to get 1 milano ash dark brown and 1 milano ash blonde. do u know which colors numbers are ash for both the blonde and dark brown?